GCC, short for Gulf Cooperation Council, represents the alliance of some of the world’s leading producers of petrochemicals – the key raw materials required for the production of synthetic polymers. These six countries are the major exporters of raw polymer to the entire globe and are second only to India when it comes to the growth rate of the polymer market. Thus, GCC countries play a major role in the overall development of the global plastics industry and are a key determinant of growth of the molded plastics market. 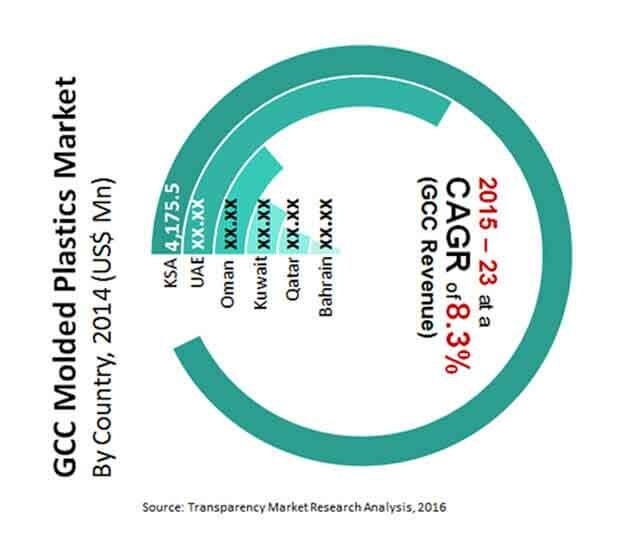 With high fragmentation in terms of number of suppliers and a level of extreme consolidation when it comes to geographic placement of major vendors, the GCC molded plastic market features a splendid mix of intense competition and plenty of untapped growth opportunities. Transparency Market Research states that companies in the market will focus more on expansion strategies in the next few years; strengthening product portfolios by including new product verities and ventures in foreign markets will be amongst the most preferred growth strategies. The overall market will expand at a healthy CAGR of 8.3% over the period between 2015 and 2023, and rise from a valuation of US$7.19 bn in 2014 to US$14.22 bn by 2023. In terms of volume, the GCC molded plastics market stood at 2.82 mn tons in 2014. In 2014, the GCC molded plastic market attributed a dominant share of nearly 52% to its applications in the packaging industry. The sector will continue to be the dominant application for molded plastic in the GCC market and will account for nearly 56% in the overall market by 2023. The packaging industry in the region is flourishing owing to the constant rise in trade activities and the substantial rise in the market for industrial and consumer goods in response to the vast rise in the region’s population. This has created manifold growth opportunities for molded plastics in the packaging sector in the past few years and will continue to drive the region’s molded plastic market in the years to come. The building and construction industry is another highly attractive application area for the GCC molded plastic market as it accounts for a major share in the overall consumption of molded plastics in the region. Stimulated by the rising population in the region, increased government spending on developing residential building projects as well as public and private infrastructure projects will also prove to be beneficial for the GCC molded plastics market in the next few years. The GCC molded plastics market will gain the most attractive returns from operations across Saudi Arabia, Qatar, and Oman in the next few years. Saudi Arabia being home to nearly 60% plastic converters in the overall GCC molded plastics market, will continue to be the leading supplier of molded plastic in the market. The market for molded plastics in these countries will also benefit from the flourishing construction industry. The UAE and Kuwait have been rated as moderately attractive countries for the GCC molded plastics market. The market in these countries has suffered a huge blow from the steep drop in crude oil prices observed recently. However, the construction industry has allowed for average growth of the molded plastics market in these countries. Some of the leading companies operating in the highly fragmented GCC market for molded plastics, which accommodates over 1,000 plastic converters, are Harwal Group, Al Barshaa Plastic Product Company LLC., Genoa Plastic Industries, Takween Advanced Industries, and Obeikan Investment Group. Molded plastics are products made up of thermoplastic or thermoset resins through a molding process. The molding process essentially requires a mold or cast in order to provide the plastic with a specified shape. Molded plastics find application in most sectors and daily products such as bottles, furniture, pipes, conduits, wires, cables, containers, caps, cases, and consumer products. This report provides a detailed description of the molded plastics market in GCC based on volume share (kilo tons) and revenue (US$ Mn) from 2014 to 2023. It highlights factors contributing to growth of the market and restraints hindering the market. Detailed forecast for molded plastics from 2015 to 2023 has been provided separately for a better understanding of the market scenario. The molded plastics market is described with respect to various segments along with potential opportunities during the next six years. The GCC molded plastics market has been segmented on the basis of raw materials into polyethylene, polypropylene, polyvinyl chloride, polystyrene, polyethylene terephthalate, and others (including Polybutylene Terephthalate (PBT)). The study provides forecasts and estimates for each raw material segment in terms of revenue and volume during the forecast period. In terms of technology, the molded plastics market in GCC has been segmented into injection molding, blow molding, thermoforming, and others (including rotomolding and casting). The study further segments the molded plastics market in GCC on the basis of major molded plastic products such as pipes & conduits, bottles & containers, cables & wires and others (including medical devices, automotive components, miscellaneous consumer goods, etc). It provides forecasts and estimates for each product segment in terms of revenue and volume during the forecast period. The study also analyzes market attractiveness for all products of molded plastics with the help of the market attractiveness tool. Additionally, the study segments the molded plastics market in GCC into key applications such as packaging, consumables & electronics, automotive & transportation, building & construction, and others (including, furniture, toys, etc). It includes forecasts and estimates for each application segment in terms of revenue and volume between 2014 and 2023. Each raw material, product, technology and application segment is bifurcated into individual GCC country in terms of volume and revenue from 2014 to 2023. Growth in construction activities across the GCC and the Middle East and North Africa is anticipated to drive the molded plastics market in the region. Increase in construction activities has been ascribed to the rising industrial development and urbanization in GCC. Uncertain demand for molded plastics in Europe owing to the economic crisis is likely to hamper market growth in GCC, as Europe is one of the major buyers of molded plastics from GCC. Investments in R&D activities and expansion of the product portfolio of local players in GCC is projected to offer growth opportunities for the molded plastics market in the region. Value chain analysis and Porter’s Five Forces Model have been presented to provide a comprehensive view of the market. These would also help understand specifics of the industry structure apart from giving an overview of degree of competitiveness. The report also includes detailed profiles of key players such as Al Barshaa Plastic Product Company LLC, Zamil Plastic Products LLC, Al Watania Plastics, Genoa Plastic Industries, Obeikan Investment Group, Harwal Group, Arab Gulf Manufacturing Company, Rowad Plastics Group, and Takween Advanced Industries. A detailed description of players includes parameters such as company overview, business strategies, financial overview, upcoming facilities, mergers, acquisitions, joint ventures, new products, and recent developments.